After you create your design and implement your web site construction either with or without designers and art directors, what then? Do you expect people will come because you build it? Remember that movie (Field of Dreams) was categorized as a fantasy? Lately I have been thinking of a good way to continually work for the benefit of the client in small ways that don't cost a lot of money for them, yet will bring that web site construction to purpose. One way is to incorporate some SEO into a maintenance agreement. Security - How can the owner ensure a site does not get hacked, or if not that then what are the best alternatives? To do all the above what do you think the time commitment would be for a developer? How many hours a month do you think it would take? Certainly the honeymoon time of the agreement would be the busiest because that is where the greatest questions would arise from the client - so the help desk would be the busiest then. But also laying the foundation for the backups and strategizing over it would be the greatest. We sync the data daily to a local database so that we always have the latest copy that way. However there are some remote servers where even the use of tunneling makes this difficult. That's another reason why a developer should be brought in to give server recommendations so that backups become easier rather than more difficult. We take the wp-content folder, the .htaccess file, the index.php file and download that to local host and tuck that away for safekeeping. That way all the plugins and images are available. We export the pages and posts and images into an importable xml file, and build a localhost copy using the resulting file. This way we have pretty much everything and can verify we have a good copy. In cases where it is a direct static site where you have local copies and are ftp'ing them to the server then you have to take a good look at your desktop and how safe those files are, as well as how hackable is the remote server. In some cases you can be sure you have at least one good copy of everything that way, as long as you sync in one direction you are generally safe. However its nice to have a portable method of safekeeping, or cloud based system such as Amazon S3 to automate the backups. The price of a terabyte of storage is getting cheaper daily. As for the rest of the agreement - doing something for the benefit of SEO is becoming more imperative because of the competition for visibility on the internet is becoming so intense. For that you have to research the terms on the page, the construction of the page (more intense if you had no part in the process in the first place), and building up a modicum of analytic structure (Google Analytics) to show improvement or regression. Recently I was talking to someone about their site and their desire to be indexed and visible for a particular search term - however when I looked at their site they had no such term on their home page, or for that matter not much of it elsewhere either. Yes I would have to say if you want to be found for a particular search term you pretty much have to have that content on your site! However not every term you think is important is the one you want to emphasize in your content. After reviewing what I thought were competitive terms, synonyms, other sites - I found alternative search terms that would be more productive to aim for. 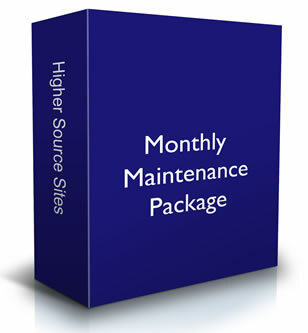 Each month should deliver similar small analytic and research steps to improve the SEO of the site.